Floyd County Prosecutor Keith Henderson speaks to DCS family case managers prior to the mock trial. The training was held at Ivy Tech Community College’s Southern Indiana campus in the Judge Carlton & Sue Sanders Teaching Classroom. Deputy Prosecutor Jessica Bansbach elicits testimony from FCM George Shaheen. DCS family case managers and Local Office Director Rico Rosado (far right) listen to opening instructions before the mock trial begins. Case managers (from left to right): Sam Charbonneau, George Shaheen, Laura Elliott, Kristen Wilcken and Lana Tucker. FCM Sam Charbonneau is questioned by Prosecutor Henderson. Deputy Prosecutor Jessica Bansbach plays the role of trial court judge as FCM Laura Elliott takes the stand. 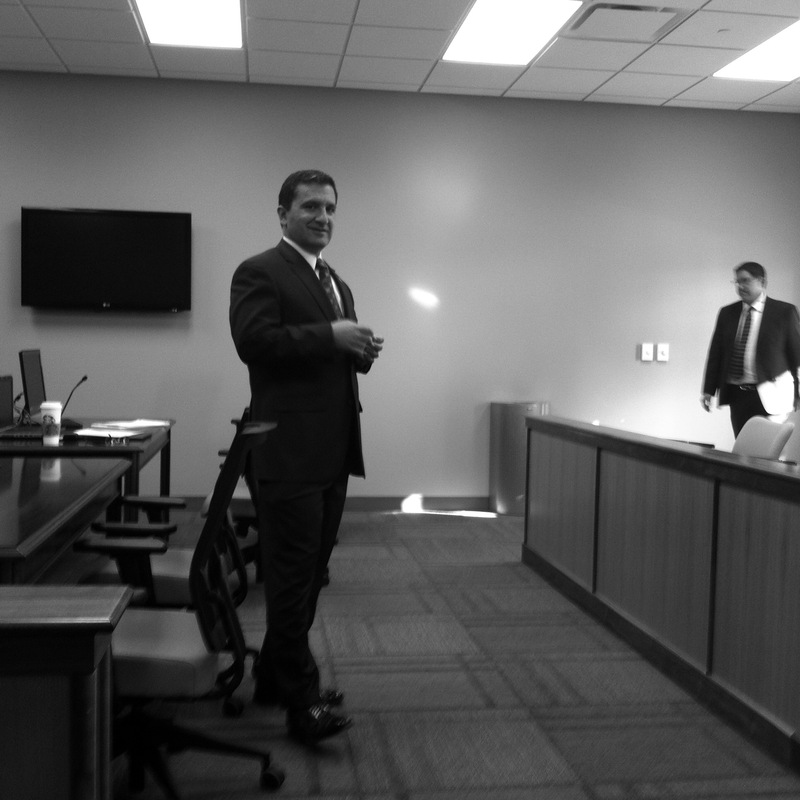 Chief Deputy Prosecutor Steven Owen during testimony of FCM Lana Tucker. DCS Local Office Director Rico Rosado observes the proceedings as Chief Deputy Prosecutor Steven Owen cross-examines a witness. Chief Deputy Prosecutor Steven Owen acts as defense counsel and cross-examines FCM George Shaheen. Chief Deputy Prosecutor Steven Owen is overruled from the bench. FCM Sam Charbonneau offers a critique to one of his co-workers. Prosecutor Henderson questioning FCM Sam Charbonneau as State’s witness. Deputy Prosecutor Jessica Bansbach questions FCM Kristen Wilcken. Sellersburg, Ind. — Ivy Tech Community College’s Southern Indiana campus was the site of a mock trial training exercise held Tuesday. Floyd County Prosecutor Keith Henderson administered the training with assistance from Chief Deputy Prosecutor Steven Owen and Deputy Prosecutor Jessica Bansbach. The purpose of the mock trial was to prepare family case managers employed by the Department of Child Services for the delivery of witness testimony during depositions and in criminal courtroom proceedings. Case managers are employed through the local Floyd County DCS Office, an agency that serves to protect children who are victims of abuse or neglect and works to strengthen families through services that focus on family support and preservation. In cases involving criminal abuse or neglect, DCS family case managers may be called to testify during trial. During the exercise, case scenarios similar to those DCS employees may encounter in their daily work were distributed for review. Each family case manager was asked to provide testimony based upon their case scenario through direct- and cross-examination. After testifying, case managers were given advice through critiques of their performance. Throughout the mock trial scenarios, Henderson stressed preparation, professional credibility, and the importance of case documentation and review.